Kelena threw back the sleeve of her kerker and bared one stringy, dried-out breast, which drooped like an empty leather bag. She ordered an extra pair of braziers, so that there was enough light. The men obeyed her without question, spreading out a well-scrubbed leather rug, while Orvo sharpened the shaman-woman's knives with great concentration. Kelena went up to the patient. Her face was long and thin. Tattoo lines disappeared into deep wrinkles like footpaths in the tundra hills. Bristly hairs sprouted from her wide nostrils. But her hands and her eyes were astonishing. Toko couldn't tear his eyes away from her fingers, marveling that a woman could have such powerful hands. Kelena's eyes burned with yellow light, as though each eye housed a blazing grease lamp. It seemed, whenever the shaman-woman cast her eyes into a shadowy corner, that she shone a torch into the darkness. Despite her unattractive appearance, Kelena aroused neither fear nor revulsion. Perhaps it was due to the huge strength and confidence emanating from her tall, withered frame, that people inevitably felt reassured and trusting toward the big and kindly woman who could not fail to help them. "To save this man, we must slaughter a dog," said she to Il'motch, quietly, but with authority. "Get one from Orvo," Il'motch replied. "But we have still got a long way to go," Orvo objected. "Armol', go and bring a puppy from my yaranga," said Kelena, taking charge. While Armol' was off on his errand, the sick man was moved closer to the center, and the braziers were raised high on supports, so that their light could fall from above. Kelena laid out her instruments on a clean bleached piece of sealskin: sharpened knives, needles and bones, tightly wound thread made of deer tendons, pieces of fur and long strips of clean, soft deerskin. Armol' carried the struggling puppy into the room. "Il'motch, Orvo, you're to help me," instructed Kelena. "The dog must be killed." Il'motch took the puppy, and Orvo bent down to help the shaman-woman unbind John's tightly bandaged hands. "You, young ones, don't go far off," ordered Kelena, "you may be needed. If he starts to scream and struggle, get on top of him and hold him down." "All right," Toko nodded, feeling his mouth dry up. Kelena shrugged off her kerker, now clad only in a narrow loincloth. As though out of nowhere, a little bottle appeared in her hands. She took out the plug with her teeth, tested the contents on the tip of her tongue and, forcing John's clenched teeth open, poured the liquid into his mouth. John thrashed and flailed his arms, but Kelena held him down with a knee. Some time passed, and John lay still. Even his breath seemed to steady. Then the shaman-woman carefully inspected her blades, spat down on each one, rubbing the spittle into the knife with her palm, and looked satisfied. Raising her face upward, she was motionless for a while, eyes shut, whispering charms. A strange thing, but it seemed to Toko that she was speaking in the white people's language. Was it because it was a white man she was about to heal? Finished with her preparations, Kelena cautiously peeled back the bandages from John's broken hands. Where they were stuck to the skin and hard to lift, the shaman-woman wet them with fresh dog's blood. As the blackened skin appeared, a sweetish suppurating smell filled the room, making everyone breathe faster and harder. The sight that awaited them could not even be called the remains of human hands. Everything was mixed together in a bloody mess—clumps of fur from the mittens, smashed finger bones, shreds of flesh and skin. Unable to stand it, Toko turned away. "More blood, more blood," called Kelena. "Let the puppy blood wash your wounds and give you a dog's endurance." With effort, Toko turned back to where Kelena was doing her work. She moved quickly and purposefully, as though she were handling walrus flippers or deer legs, not human hands. The blade slid over joints, separating the bones and leaving large, hanging folds of skin. Tossing aside a severed hand, Kelena picked up a needle threaded with deer tendons. A straight, beautiful seam began to stretch across the stump, and little droplets of blood marked the needle's wake. The shaman-woman's face was covered in perspiration. Sometimes she would wipe the sweat from her forehead with an elbow and sniff impatiently. Having finished with one hand, she moved on to the other. And then what everyone was dreading happened: John became conscious. At first he looked up, surprised, at the shaman-wornan who was bent over him with her knife. Then, his face twisted in a grimace of horror and revulsion, he let out an awful scream and thrashed under her hand. "Hold him," Kelena shouted. "Hold him tight!" Toko and Armol' threw themselves over poor John, tried to weigh him down. But the white man was still strong and quick. More than once he managed to throw off their combined weight. But, ultimately, what can a cripple do? Orvo and Il'motch came to help. "He mustn't move his hand!" were Kelena's orders. "You, Armol', hold his arm, and the rest of you, don't let him move." Finally, they were able to bear down so that John couldn't move a muscle. Toko was almost lying on top of him, face to face, feeling John's hot breath on his skin. John's large blue eyes were frozen with terror. Big tears rolled out from an overflowing blue lake, quickly running down his cheek and somewhere behind an ear into a thicket of light hair, wet with perspiration. He was muttering something. Quickly, hurriedly. His tone conveyed pleading, horror, promises, pain, rage . . . Without having understood a single word, Toko answered him. "Just bear it for a little while longer. All will be well. This woman is saving your life, don't fear her . . . Your pain is hurting me too, but it must be borne. To go on living, it must be borne. You want to see your land, your mother, your loved ones, don't you? Maybe you have a wife? You'll come back to them alive. Without hands, but so what? White people have many jobs that don't require hands. So you'll do that kind of job. Besides, you folk are clever with gadgets and contraptions, you'll manage to fix something in place of hands. You've figured out many things; big fire-breathing boats like mountains roaming the seas, you've forced flame into a little jar, and it burns there with a noisy blue heat. Came up with guns, food in tins . . . All will be well, Son." "Grab him tighter," Toko heard the shaman-woman's voice, "I'm going to start sewing." Toko leaned over John again and continued over his muttering. "Kelena can sew. She'll make you a seam you'll be proud of—brag to all your friends. Deer-tendon threads are strong, they won't tear... Don't twitch, there's only a little left now. The blizzard will end, we'll drive back. It won't take two days to get to Enmyn, and you'll see your friends again. The ice has gone, it's a clearway. You'll sail off . . . Just a little more, now. It's hard for me too, looking into your eyes . . ."
John lost consciousness again, or else decided that resisting was useless, and Toko realized that it was easier to hold the white man down. Through half-closed eyelashes, heavy with tears, John watched his torturers. When the terrible hag swam into view, sharp knife in hand, he had thought that they were intending to eat him. And right away he recalled tales of cannibals, devourers of human flesh, of savages who roast their prey over dying coals. He could smell his own burned flesh, the singed hairs of his beard. He writhed and screamed, trying to reach Toko's dark, sweaty face with his teeth, trying to reach the treacherous and bloodthirsty brute that fed him from his own hands, cared for him, only to pin him down later, until each of the others had cut off a tasty morsel. But it was an unequal battle. Toko lay on top of him like a boulder, and there was an incredible amount of weight in the young man. It was useless to fight. And it was then that John was seized by such self-pity that he couldn't restrain his tears. They rolled down his feverish cheek, calling up an overwhelming feeling of bitterness and irreparable damage. He had never been so helpless. Perhaps only somewhere in the foggy deep of childhood, in a life lost forever. Still, it was not the life he'd already lived that he grieved for, but that he'd never go home, never appear on the doorstep as the conqueror of polar seas. All the joys of the world will be for those who, at that moment, haven't an inkling of death. They will belong to Hugh Grover, his friend, the only one, maybe, who is hoping for his return. Poor, dear Hugh! Freezing in an ice-bound little ship that seemed so strong and secure, waiting for his friend. It was as though a stone slab were weighing him down, and not a human being. A slab reeking revoltingly of sweat, rancid seal fat, and something else, filthy and unbearable. Nausea assailed him. The pain had grown numb and, oddly, moved to his heart. But maybe he was dead, and all that was happening didn't matter. And the heavy weight—it was only the weight of the gravestone, laid over his final resting place. John closed his eyes and willed himself not to open them again, to shut out the hateful features, shiny with grease and sweat. He sensed some kind of commotion. They were doing something with his hands! But what? John opened his eyes again. Strange—he had always been certain that the Chukchi had narrow slits for eyes, yet this one had enormous black irises, with intense sorrow and pity in their depths. "What are you doing to me?" John shouted. "Let me go! You'll pay for this!" "Just stick it out a little longer," he heard the voice of Orvo answer back. "Only a little while left." "What are you doing to me?" John was howling. "Taking care of your hands!" Orvo shouted back at him. "Taking off black flesh, saving your life!" "Dear God," John moaned. "My hands! My hands!" He did not feel the shaman-woman Kelena carefully tying soft deerskin strips over his stumps. But suddenly he understood that these primitives had cut off his fingers, barring the way for gangrene. What barbarism! A good surgeon could surely have rescued at least two, three fingers on each hand . . . And they . . . What if that horrible witch had chopped off both his hands? John opened his eyes and saw that Toko had let go of him and was now sitting beside him, studying his face. "He's come back!" Kelena pronounced it with joy. "He's moving his eyes." "What have you done to me?" John asked quietly, addressing Orvo. "What have you done with my hands?" "It had to be done," Orvo answered. "Your flesh went black. Death stood close beside you, and you would have shut your eyes forever. There was only one way out—to take away the black flesh and black blood. And that's what she has done." Orvo nodded toward the shaman-woman, who was wearily packing a tobacco pipe with a huge convex mouthpiece. "Oh, my Lord," John sobbed, and burst into tears, mindless of the others. "Who's going to need me without hands?" Kelena wiped her bloody fingers with a wet cloth, smoothed her hair and looked at John with a smile. "What's he wailing about?" she inquired of Orvo. "Crying over his hands," said the old man. She walked closer to John and softly stroked his head. At the touch, John turned sharply and saw the old woman's hideous face. Her skin was like something baked in a roaring fire. Her burning eyes held untold tenderness. It was awful—compassion and ugliness intertwined! He made a move to push the old woman away, but lost consciousness again, sinking back into the furs. Kelena tucked him in, saying, "He'll sleep a long while." Gathering her instruments neatly into a special leather bag, she began collecting what was left of the puppy and what she'd cut off with her knife, wrapping the stuff in a square of deerskin. She looked around, hummed approvingly and called out to Orvo, "You'll help me." There were dogs in the chottagin, curled up asleep. A fine powdery snow drifted in through the smoke-hole, and the blizzard shone down with a faint, mysterious light. Kelena lifted the stone that held down the pelt hanging over the entrance, and instantly, the wind rushed into the yaranga, tousling the dogs' rough coats. The pelt flapped and buckled in her hands. Orvo rushed to help the old woman. As soon as they were outside, Orvo and Kelena were caught up in the whirlwind. Orvo followed the old woman, who had steamed forward into the wind at a clip. He was beginning to worry about going too far from the yarangas when, all of a sudden, the shaman-woman stopped dead in her tracks. She stood there like a broken-off fragment of a mountain crag, set in the face of the gale. And the blizzard's gusts passed around her, quickly raising a snow funnel around this living, motionless idol. She stood still for some time, whispering prayers and incantations, then reached down and dug a deep hole in the snow. Into the hole she lowered the puppy's remains and the severed hands of the white man. The dogs, well-rested over the days of the blizzard, pulled well, and soon the sled caravan left the grazing camp and its welcoming valley by the foot of the mountain range far behind. John looked back for a long while, seeing the yarangas' smoke in the blue twilight. A kind of new, unfamiliar feeling trembled in his breast; it might have been gratitude toward the people he was leaving behind, people that had treated him with such warmth and compassion; or perhaps the happy expectation of seeing Hugh Grover, who waited for him at the Enmyn cape; or perhaps it was the understanding that he'd escaped the bony hand of death that had been cast over him . . .
Toko sat sideways on his dogsled, also glad to be going home. Even if the captain doesn't put up the reward, to hell with the Winchester, it could have been worse. What if Sson had died on the road, or after his fingers had been cut off? Then they would have had to forget the way back home and find another place; probably, they'd have to hide out in the tundra. It goes without saying, tundra folk live well, especially if their herd is as big as Il'motch's. The food is right outside the yaranga, and all you have to do is keep an eye on the deer in a blizzard and keep the wolves off. But the wandering! As soon as you're used to a spot, you've got to roll up your yaranga and go find another . . . Toko considered the deer-herding life compared to the life of a sea hunter and concluded decisively that, although the shore dweller hasn't got a four-legged food supply waiting by the yaranga walls, still his life was far better. You can leave the yaranga on an early morning and look out onto the same unbroken line of the horizon. There's nothing better than running the dogsleds in such weather, right after a long hard snowstorm, when spent nature seems to be resting after the last days' work. Silence hangs over everything, horizon to horizon, and the sound of gliding runners, the dogs' uneven breath or human voices, travels far and wanders the air, bouncing off icy crags and snowbound hummocks. There's barely any frost. Spit, and the spittle lands on the snow, without having been frozen to an icy white lump in midflight. You can ride on top of the sled for long stretches, without having to jog alongside it for warmth. Making nearly half the distance between the mountains and Enmyn, Orvo signaled a rest stop—to give themselves and, more importantly, the dogs a breather. They made camp on the ice-bound river shore, putting up the tarpaulin tent. It was cramped, and only by bunching together could all four adults fit inside. Really, the tent had been meant for John, but he'd insisted strenuously on all the drivers piling in. By some miracle, Orvo had managed to find a few dry twigs and make a fire. For a nightcap, each man received a mug of hot tea, strongly laced with vodka. Dragging in all the deerskins he could find on the three sleds, Toko made a fluffy bed for John. "I'm as healthy now as any of you," John declared. "I shouldn't have any special treatment." "Do you like this sort of life?" "What sort?" At first Orvo didn't understand. "The life that you lead out here, in the snows, in the frost?" John clarified. "There are other lands, you know, where life is more comfortable. It's warmer there, and there aren't such terrible snowstorms, like the one we've just lived through. You can weather one blizzard, at most two or three, but all your life! It's impossible! Take you, Orvo—you've seen other countries and other lands. Didn't you like them? Eh?" "I liked them," Orvo said, uncertainly. "You see. That means your homeland must be less comfortable," John concluded. "Maybe so," Orvo agreed, and turned on his side with the intention of falling asleep, but John was evidently determined to make up for all the days of his silence. "So what's the matter?" he asked. "Look here, the entire American continent is peopled with men who came over from other places. These men crossed enormous distances in search of a better life, in search of a better land." "It's no good to us," Orvo answered. "We believe that we live on the best land in the world. That's the beauty, that no one wants it except for us . . . I've seen our neighboring Eskimos forced to leave the coastline, because gold was found there." "Well, maybe you're right. Maybe it's only because the Chukchi and the Eskimos settled in the worst lands that they've escaped annihilation." Such talk chased away Orvo's desire for sleep, and no matter how he twisted and turned, on his side, on his back, still he couldn't fall asleep. Growing sure that neither John nor Toko nor Armol' was asleep, Orvo decided to broach a worrying and important question whose gravity bore no comparison with any of John's deep and meaningful queries. "What do you think," Orvo asked, "will the captain give us the promised reward?" "Why wouldn't he?" John was surprised. "Because we didn't get you to Anadyr'. And the work that the Russian doctor ought to have done, was done by the shaman-woman Kelena." "That's no matter," John shrugged. "I only have to say the word, and Hugh will give you not only what he promised, but more besides. Have no doubt—your reward awaits you." "Do you hear that?" Orvo couldn't hold his tongue. "He says we'll be paid in full!" "That means I'll have a new Winchester!" exclaimed Toko. John looked at his excited companions with a patronizing smile. How little these savages needed to be happy! No more than an old Winchester, one that's only good for the garbage heap in another world. The reassurance that their reward would be paid in full, so agitated John's fellow travelers that for a long while there was nonstop talk inside the small tent, and Orvo himself promised John that they would do everything in their power to get him back to the ship at top speed. John barely closed his eyes that night. No sooner had his eyelids begun to inch down, than he could see before him the ship's silhouette against the black crags of Enmyn, Hugh's kind manly face, could hear the voices of his comrades, and good old English speech instead of this barbaric babble, where you can't tell where one word ends and another starts. Morning came in the shape of a light crimson stripe over the eastern horizon. After a hurried snack, the travelers were under way and heading for the shore. The drivers ran alongside their sleds, so as not to exhaust the dogs and conserve strength for the long unbroken journey ahead. By the time the Northern Lights blazed across the sky, the dogsleds had reached the south side of the lagoon. If you listened carefully, you could already hear voices rising from the settlement, dogs' muted barking, a child's cry. Sensing the nearness of home, the dogs ran without urging. Toko overtook Armol', then Orvo, and together with John broke into the lead position. The pack had been about to make a turn for the yarangas, but Toko shouted at them and steered them toward the seashore, to the craggy shelter where the Belinda lay. Awakened by the barking, people were spilling out of their yarangas. They ran after the sled, shouting something, but it was impossible to make out a single word against the furious gallop of the pack. The sled flew down the shore. Joyfully, tenderly, John looked out into the open sea that was soon lost from view over a dark horizon. Not a single piece of ice—the storm had cleared the water's expanse: Sail away to your heart's desire. But the place where the Belinda had lain was empty. Toko held back, but John yelled something impatient and motioned ahead into the darkness, closer to the crags. Toko started the sled again, and drove slowly, wary of falling off the high shelf of fast ice and into the water. John peered into the darkness, trying to discern the lines of a ship, until his eyes ached. He begged Toko, pleaded with him to come closer to the water's edge, but the sea was empty. Under the crags it was empty, too. Joy was beginning to turn into worry and fear: What had happened to them? A shipwreck? But surely someone, even a single man, must have survived? "Come back!" the people were screaming after them. "The ship is long gone! Nothing there, come back!" Toko looked at John. But the other, not understanding the Chukchi language, was scanning the empty black stretch of open water in desperation. When his eyes met Toko's, he shuddered. "Is it true?" he asked Orvo, who'd made his way forward. "Yes," said the old man, head bent low. "They sailed on the very first day, as soon as the sea was clear of ice. They were in a great hurry, and didn't even come down to make their farewell." "It can't be! It can't be!" cried John, and facing the sea, he howled: "Hugh! Hu-u-u-ugh! Why don't you answer me? Have you abandoned me? Oh God, but it's impossible!" He jumped off the sled and ran for the edge of the fast ice. "Hold him back, he'll fall into the water!" Orvo shouted fearfully. Toko caught up with him and grabbed him from behind. John was struggling, kicking, but Toko held him close. "Hugh, come back for me! Don't abandon me here, don't leave me with these savages! Oh, Hu-u-u-gh!" John fell to his knees, and then forward, prostrate. He couldn't speak at all now. His body convulsed with sobs, and his throat produced a drawn-out, animal howl—the cry of a man betrayed by his own tribe. The Chukchi, observing the white man's grief, stood motionless; not one of them had made a sound until John went quiet, pressed flat against the ice. All around, silence reigned. And the people imagined that they could hear the rustling draperies of the Northern Lights overhead. Toko approached John cautiously. The other's eyes were wide open and gazing straight ahead into the distance. It seemed that he was seeing something far away, something that neither Toko nor any of his kin were ever to see. Yellow foam adhered to the corners of his mouth, and his face had taken on a strange aspect. It was as though a countless number of years had flown over his head, and it even seemed to Toko that there was a glint of gray in the hair escaping from underneath John's fur-lined hat. "Take him back to the yaranga," Toko heard Orvo's quiet voice. Toko clasped John around the middle and prepared to lift him up. But John, though slowly, rose by his own effort and leaning on Toko, limped toward the yarangas, black against the snow and the spill of the Northern Lights. And from the north, wordlessly, without wind or wave, with barely a rustle, came fields of ice—to shut up the wide waterway so recently opened by the storm. A story from Russia with a different connection to Siberia: this oral history describes a man's imprisonment in the Siberian gulag. An indigenous Mexican man moves his family to a large city. "Look here, the entire American continent is peopled with men who came over from other places. These men crossed enormous distances in search of a better life, in search of a better land." Another story of cultural difference in which the word "savage" is used. In this chapter of the eponymous novel, set in Siberia in 1910, a Canadian explorer named John MacLennan has been terribly injured. The leader of his expedition has asked several of the local men, from the Chukchi indigenous group, to take him to get help. Containers for burning hot coals, used for heat, cooking, and cultural rituals. A tent-like home, or yurt, made of wood and reindeer skins. A coverall made of reindeer or seal hide worn by Chukchi women. The cold, outer part of the yaranga (from translator's note from published edition). Published in Words Without Borders' April 2005 issue: PEN World Voices. Born in Uelen, a village in the Chukotka region of Siberia, Yuri Rytkheu has sailed the Bering Sea, worked on Arctic geological expeditions, and hunted whale in Arctic waters, in addition to authoring over ten novels and collections of stories. In the late 1950s Yuri Rytkheu emerged as not only a writer of considerable literary talent, but as the unique voice of a small national minority-the Chukchi people. His novels and short stories about Chukotka introduced generations of readers to the history and mythology of those who call one of the most majestic and inhospitable environments on earth their home. Bestsellers in Germany and Switzerland, Rytkheu's works are also well-loved in Japan, Finland, Denmark, and France. Ilona Yazhbin Chavasse was born in Belarus and, together with her family, emigrated to the United States in 1989. She has translated the work of Dimitry Bortnikov, Sergey Gandlevsky, Ilya Brazhnikov, and Yuri Rytkheu. Educated at Vassar College, Oxford University, and University College London, she now lives in London with her husband and two goldfish. Listen to pronunciations of the names and places from this story, read aloud by Dmitry Kurbanov. The excerpt from Yuri Rytkheu’s 1966 novel A Dream in Polar Fog has “East” meet “West” in the icy land of Northeastern Siberia. . . . West is the “home” left behind in 1910 by the protagonist, a young Canadian sailor, John MacLennan. When his ship “Belinda” is trapped in ice in the Bering Strait, MacLennan blows up his hands trying to break the ice with dynamite. At request of his captain, he is to be taken by the local Chukchi to a doctor in Anadyr’, a Russian port, but the blizzard prevents him and his guides from reaching their destination before his gangrene spreads. The excerpt describes his treatment by a Chukchi shaman woman, Kelena, who, together with two Chukchi men, saves his life by amputating his hands. Fear, prejudice, the inherently “patronizing” sense of superiority of a white westerner looking down on his indigenous companions Toko and Orvo as “primitives” and “savages,” eventually gives way to understanding and empathy, as MacLennan realizes that his ship has left him behind. . . .
Find out why, according to traditional Chukchi values, stinginesss is the worst possible character flaw. Then, learn about important terms and concepts in Chukchi culture with flashcards on Quizlet. Look at the Chukotka region of Russia on the map. Learn about Chukchi life, and understand more about the distinction between the “deer-herding life” and the “life of a sea hunter” which Toko ponders in the story. 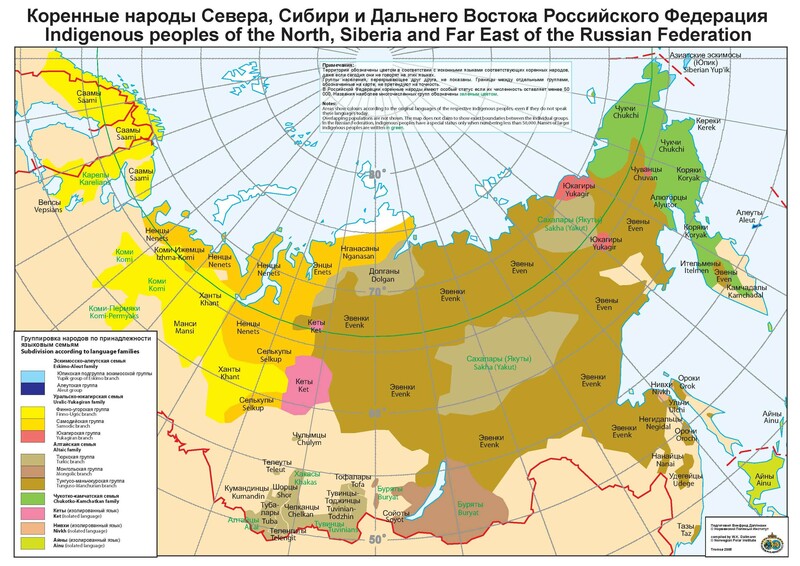 Scroll down to read about the relationship between the Russian and Soviet state and the Chukchi people. Look at pictures taken on the failed Chelyuskin expedition to the Chukotka region in 1933-1934 (click on the thumbnails to enlarge the images): a young Chukchi woman, a young Chukchi man, and an older Chukchi man; someone on a dog sled next to the ship; and sled dogs. Curious about this expedition, which, like John's plans, was derailed by ice? Read about the dramatic rescue of the stranded passengers on Russapedia. Then, look at a photo from 1900 of Chukchi people outside of their yaranga. Browse through more photos from expeditions, taken around the time period of this story. Learn about the Chukchi people on an archived ethnographical website from anthropologist Patty Gray, documenting her fieldwork in the late 1990s and early 2000s. Listen to an audio recording of the Chukchi language (Chukchi activist Vladimir Eytlin telling a funny story) and then read about the Chukchi people's efforts to preserve and promote their language in the post-Soviet era. Learn about author Yuri Rytkheu’s role in building an understanding of the Chukchi people in the USSR and Russia. Read a blog post by WWB contributor Russell Scott Valentino, about the book A Dream in a Polar Fog, which he taught in his class. Valentino provides some key background information about the novel's plot and history. Read “The Last Shaman,” a review of Yuri Rytkheu’s The Chukchi Bible. Although this review is cut off by a paywall after two pages, those pages are worth reading for their explanation of the Chukchi people's fierce reputation and of the controversy surrounding Rytkheu. Read “The Chukchi: Who are the people of Russia's freezing northeast?” to find out more about Chukchi people today. Then, watch a video about Chukchi people who are introducing Muscovites to their culture. You can see a demonstration of a shamanistic ritual towards the end. Watch a short video that shows a yaranga and a sled ride in Chukotka. The Chukchee say that young persons destined to receive shamanistic inspiration may be recognized at a very early age, even in their teens, by the gaze, which, during a conversation, is not turned to the listener, but is fixed on something beyond him...The eyes of the shaman are very bright . . . which gives them the ability to see “spirits” even in the dark. Look at photos of the Northern Lights from remote Siberia. Read the first chapter of this novel, published online by Archipelago Books (PDF), or the full book in print. Read "The Creation of Earth, Sky, Waters and Men" (PDF), a chapter from The Chukchi Bible, a collection of myths and tales told to Yuri Rytkheu by his shaman father. For another chapter about a shaman, try "The Safekeeping of Names" The book is available from Archipelago. Then, read an older collection of Chukchi myths, collected by anthropologist Waldemar Bogoras and published in 1910. Watch artist David Rothenberg’s video interpretation of Rytkheu’s story of a man who lost his family in the sea (Magic Numbers). Then, read the artist’s description of this project, created during a trip through the Arctic Circle. Read The Way of Kinship: An Anthology of Native Siberian Literature, which includes a story by Rytkheu. Read a poem by Andrei Gazha, the first recipient of the Yuri Rythkeu Literature Prize. Find out how Yuri Rythkeu got his name in a letter about a planned visit to UVA decades ago (PDF). Yuri Rythkeu has been compared to Jack London, an American author and socialist who was widely read in Russia during the Soviet era. Read or listen to Jack London's most famous short story: "To Build a Fire" (text); "To Build a Fire" (audio). Look at the photos of modern-day Chukchi people in Siberia, taken by a photographer who photographs indigenous people across the world. Hover over the “i” buttons on the right side of the page for interesting facts and more information. Then, watch the photographer's TED Talk. At 10:55, he describes his time in Chukotka, which was a 13-hour plane ride from Moscow. Next, look through another collection of photos of Chukchi people on the Arctic Photo website.
. . . and watch amateur footage of modern-day Chukchi life. Listen to a Chukchi lullaby, performed by the Ergyron group, a popular group that performs traditional Chukchi music. Learn about Russia's history of "Chukchi jokes" and find out what those jokes reveal about xenophobia and ignorance. Read a story from Russia with a different connection to Siberia: in “The Wondrous Deer of the Eternal Hunt,” Gleb was imprisoned in the Siberian gulag. 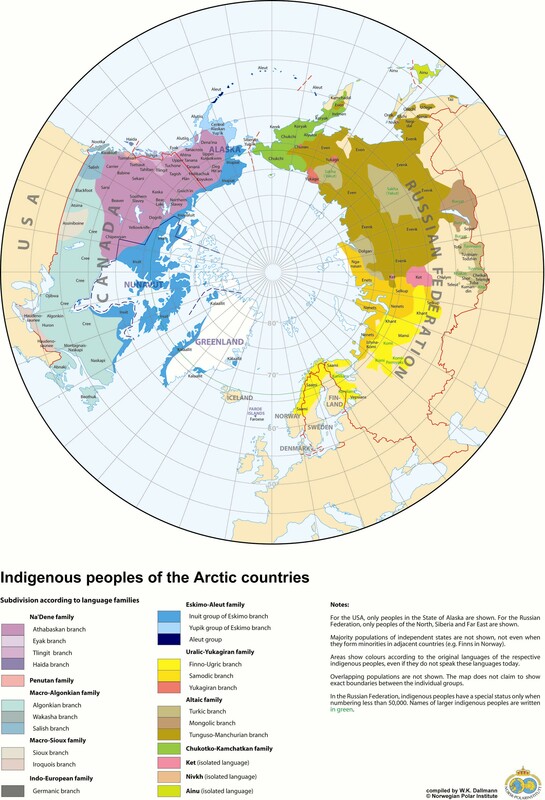 Learn about the Chukchi language from Omniglot. Learn about the parallels between the exploration of the American West and the discovery of Siberia on the (somewhat dated) site Meeting of Frontiers. The collection includes images of: explorers with frozen beards and Arctic ice scenes. In one image, they seem to be lowering down an injured or sick person, like John. Click on the links on the index page to browse the full gallery. Why was John so quick to think the Chukchis were cannibals? Victorian literature may have played a role: read Wilkie Collins' novella, The Frozen Deep, based on a false story about Inuit cannibals; then, read the history of this falsehood. Read The Predicament of Chukotka’s Indigenous Movement, by anthropologist Patty Gray (whose online materials about the Chukchi people are in the Context tab) to learn about post-Soviet relations between the Chukchi indigenous movement and the Russian government. Were you surprised by the mode of travel in this story? It turns out that, as the National Geographic headline puts it, "Sled Dogs Have Been Pulling Us for Millennia." Or, view the photo gallery, which includes a 1910 image of a doctor traveling by sled to pay a house call. Three sled dogs in a snowy Alaskan landscape.By Rear Admiral Harley D. Nygren, NOAA Corps (ret.) - NOAA At The Ends of the Earth Collection. College students and instructors might be interested in the academic article “The Divided Self: Yuri Rytkheu and Contemporary Chukchi Literature,” available behind a library wall. A list of resources on migration in world history, from the University of Illinois. "The Bed"—"Look here, the entire American continent is peopled with men who came over from other places. These men crossed enormous distances in search of a better life, in search of a better land." "The Only True Guide to Russia"
"The Pharaohs of Egypt," which also includes the term "savage"
A blog post on Othering.